Jemma: The clouds. Just the white clouds. They’re the best. Because then there is no rain and then they hide the sun too. As the little princess wished, we ended up with a plain ol’ cloudy morning shortly after her lamentations about the autumn rainfall. 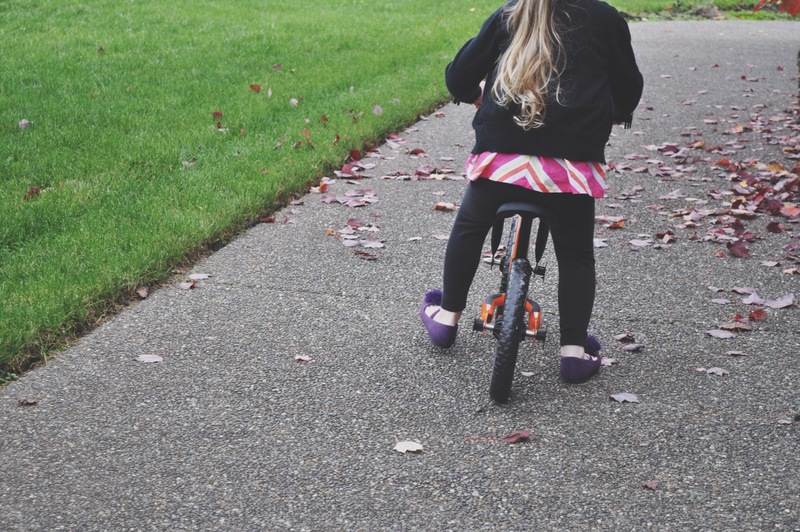 A perfect day to take her new balance bike for a spin. 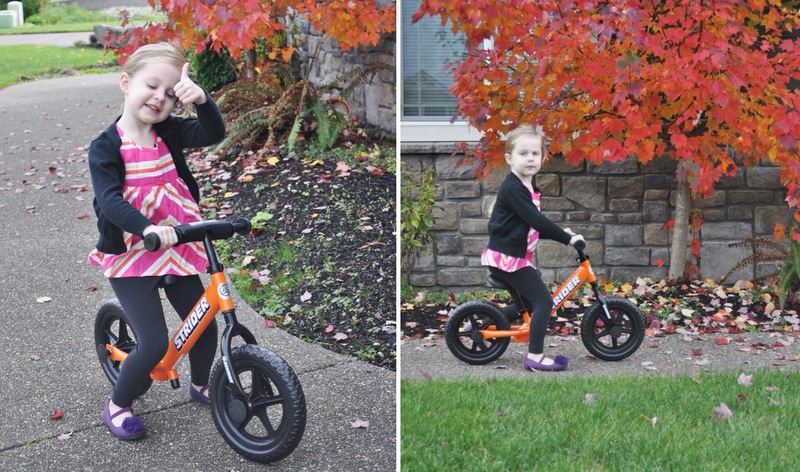 I think we’ve found a real winner with our balance bike from Strider Bikes. It’s super lightweight, was easy to assemble and comes in a bunch of fun colors. I see many more cloudy days of bike riding in our future! 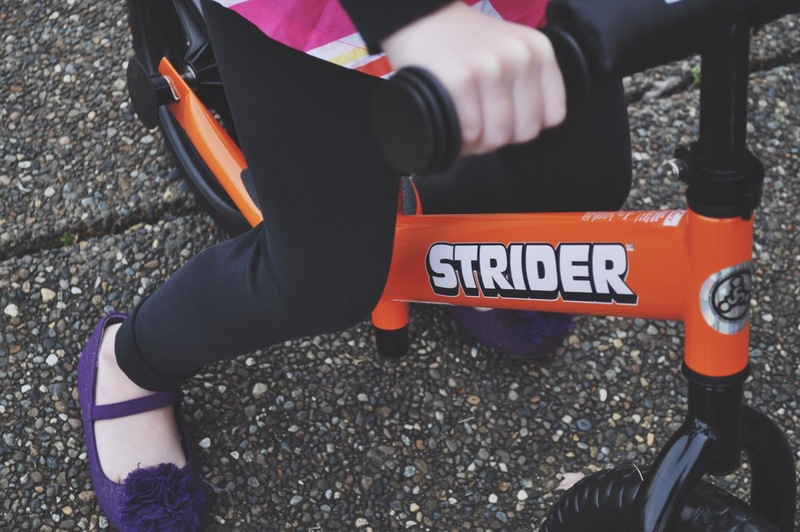 Find Strider Bikes on Facebook, Twitter and Instagram. They highlight Strider races and I’m floored by all these kids can do on their bikes! P.S. Jemma travels at about .0005152 miles per hour on her bike currently and thus, I didn’t require her to wear her helmet during these photos. As her confidence and speed grows you can bet your britches she’ll be adding her Dora helmet to the mix. Safety first! We were gifted a Strider Bike, no other compensation was received. All opinions are my own and of all the balance bikes I’ve encountered in my day, I’m truly impressed with Striders quality! jemma is adorable but that tree – wow!!!! makes me miss fall even more. I am loving the weather we are having here in the PNW! Although, the wind last week was crazy and the air quality is lacking. LOL. We are never happy!